Cash and liquid investments are fully subject to Zakat. If interest has been earned on your liquid investments, then it should be given to charity and only the principal amount should be noted for Zakat purposes. Gold and silver, in whichever form (jewellery, coin, ingot etc.) is subject to Zakat. If you own personal use items made from a mixture of metals, these are only liable to Zakat if half or more of the metal is gold or silver, although some scholars hold that the proportion of gold or silver in any owned asset is Zakatable. You can ascertain the current value of your gold by consulting your local jeweller. If shares are purchased with the express intention for resale then the entire holding is subject to Zakat. If however, shares are purchased as an investment to generate dividends, then as Zakat is only due on the Zakatable assets of the firm, a realistic attempt must be made to calculate the percentage of the shareholding relating to Zakatable assets. Any dividends received should be added to one’s cash balance for Zakat purposes. The house in which you live is not subject to Zakat. If a property or another fixed asset has been purchased with the express intention to re-sell, then the entire value of the property is subject to Zakat. If there is any other intention, then it is not subject to Zakat. Any rental income from properties owned should be added to one’s cash balance for Zakat purposes. Zakat is payable in full on pensions received after retirement. For monies set aside for pensions prior to retirement, Zakat is only payable if the pension assets are being invested on behalf of the pension holder. If no such investment is being made, then Zakat is not payable. Please note if pension monies are able to be invested, care should be taken to invest in Sharia compliant investment, and the Zakat liability will be determined by the nature of the investment (property or shares etc as per points 3 and 4). Zakat is payable on strong debts, i.e. money that is owed to you that you are confident will be paid. This may include business debts, personal loans to friends and family. This does not include outstanding wages, dowry, inheritance or assets held in trust (other than assets held under a Bare Trust). Business assets are subject to Zakat. These include cash, finished goods, work in progress, raw materials and strong debts i.e. money owed to the business that is likely to be received. All business assets should be valued at their current market price. For finished goods, this should be the retail sale price. For unfinished goods, this should be whatever price you expect the unfinished good to fetch on your Zakat anniversary date. Zakat is one of the five pillars of Islam and an act of worship. The meaning of zakat is “to purify” and so to purify our own wealth all Muslims are obliged to pay a portion of one’s assets to help those in need. Zakat benefits the giver as well as the receiver. Zakat can also be spelled as zakah or zakat. Where do Zakat payments go? According to the Qur'an - The poor, The destitute, Administrators/collectors of Zakat, New Muslims facing hardship, To free slaves, Those who are unable to pay their debt, In the path of Allah (swt), and Travellers who cannot afford to return home. All Muslim adults who are sane and possess the nisab (a minimum amount of wealth held for a year) should pay Zakat. How much is the nisab? Nisab can be determined in terms of gold or silver. The Nisab is 85 grams of Gold. So if your total wealth (Which qualifies for Zakat) is less than the price of 85 grams of Gold, then you do NOT need to pay zakat but if it is higher than the Nisab (85 Grams of Gold) then you MUST pay zakat on the entire amount. From the drop down menu, Select your currency ie USD then select 'g' for grams and multiply that figure by 85. 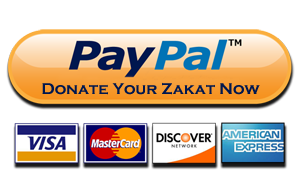 How much Zakat do I need to pay? Although there are no specific guidelines in the Holy Qur’an on exact percentages to be given as Zakat, the customary practice is to give 2.5% on capital assets. On agricultural goods, precious metals and livestock, the rate varies between 2.5% and 20%. How do I work out how much Zakat to pay? You don’t have to do lots of complicated maths to work out your Zakat payment, simply use our handy online calculator at the top of this page. What types of wealth are included in Zakat? Assets that are included in the Zakat calculation are cash, shares, pensions, gold and silver, business goods, crops and cattle and income from investment property. Personal items such as home, furniture, cars, food and clothing (unless used for business purposes) are not included. When should I pay Zakat? Zakat is payable as soon as the nisab (minimum amount of wealth) has been held for a lunar year. If the date of first becoming sahib-un-nisab (owner of wealth equal to or in excess of nisab) is known then use that as your Zakat date, if not, a date may be chosen. Use the same date every year thereafter. Wealth can fluctuate during the year, going above and below nisab. Zakat is only due if wealth is in excess of nisab at the end of a person’s Zakat year. What if I miss a Zakat payment? If Zakat has not been paid in previous years, whether through negligence or ignorance or error, then an honest attempt must be made to calculate the payment owed. This must then be paid as a matter of urgency.